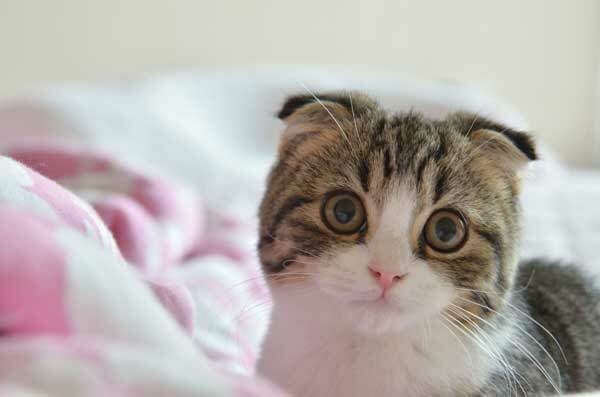 With his unique folded ears, the Scottish Fold tends to remind people of an owl. Add to that his tendency to strike unusual poses and you have one of the cutest members of the cat family. The Scottish Fold is a small to medium sized cat, typically weighing 6 – 12 pounds. They have medium bone with a proportionate body that is round in shape. Round is a word that can be applied to most aspects of the Scottish Fold. Although they appear round, it is muscle, coat and body shape rather than fat that gives them that roundness. The tail is also in proportion to the body as well. Because the gene that causes folded ears can also lead to stiffness and joint issues, particularly in the tail, it is important to gently check the tail for flexibility. The head often makes people think of an owl. The neck is short. It is round in shape with a sweet, open expression. The eyes are round, wide set, and add to the cat’s sweet expression. The eye color generally co-ordinates with the coat color. The ears are ideally folded multiple times so that they are almost flat against the head. A single fold occurs half way at the ear. They can be further folded to a double or even triple fold. The gene which is responsible for folded ears is a dominant one and only one copy needs to be present to get folded ears. This means that a cat with folded ears can produce normal eared kittens as well. These kittens will have the same wonderful personality as a kitten with a folded ear but will never have folded ears. When the kittens are born, the ears appear normal and do not begin to fold until the cat is about three weeks of age. 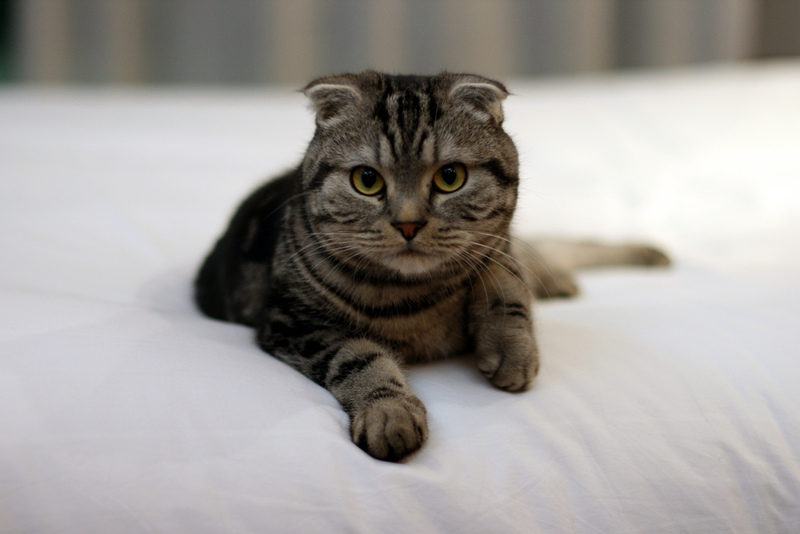 The Scottish Fold comes in both short and long coated varieties. All colors are permissible. While the short coat does not require much grooming, the longer coat should be brushed and combed regularly, at least once or twice a week. The gene that causes the folded ears is a naturally occurring mutation, first discovered on a farm in the Tayside region of Scotland in 1961. William Ross, a shepherd spotted a white barn cat named Susie with folded ears. When he was offered one of her kittens, he chose a female, Snooks that also had folded ears. So, the origin of today’s popular Scottish folds can be traced back to Susie. Snooks would go on to be bred to a few different cats including a British Shorthair. Working with a geneticist and using various cats including British Shorthairs, American Shorthairs, and domestic cats, the Scottish Fold breed began. It was initially referred to as the lop cat, after lop eared rabbits. The name was later changed to Scottish Fold to recognize its heritage. In the 1970s, the breed came to North America where other breeders became interested in it and it was soon recognized. Ironically, in its native land the Scottish Fold is not a recognized breed due to concerns over health issues related to the ears. Today, breeders can outcross Scottish Folds to American Shorthairs and British Shorthairs to keep the gene pool healthy. Two folded ear cats are almost never bred together as this can result in spinal and joint issues related to having two copies of the folded ear gene. The Scottish Fold is generally a health cat that lives well into his teen years. There is good reason that a folded ear cat is usually bred to a British Shorthair or American Shorthair. When only one copy of the gene is present there are no associated health issues. However, when two copies are present the cat may develop congenital osteodystrophy. Congenital osteodystrophy basically leads to a thickening of cartilage. As it thickens, the joints tend to shorten and become stiff. Most often affected are the tail and legs. As the cat ages, activity may become increasingly limited and painful. The bones may be sore to the touch and the cat should be handled very carefully. Treatment generally consists of anti-inflammatories and pain control. Although the condition is not fatal, euthanization may sometimes be recommended if the pain is extreme and uncontrollable. The folded ears are no more prone to infections than the ears of other cats but they can suffer from wax buildup. It is advisable to gently clean them on a regular basis to avoid any complications. The Scottish Fold is an affectionate, playful companion. They are people oriented cats that like to be with their families. They are equally happy to greet guests and welcome them into your home. No one is a stranger for long. They love to spend time with you but are not as demanding as some other breeds. Some describe it as a combination of British decorum and American self-confidence. They have a medium activity level and love to play with chaser toys and puzzle toys. They will play happily with children and tend to laid back overall. They are quite intelligent and will quickly learn tricks such as how to open your cabinets. They are willing to learn games such as fetch as well. 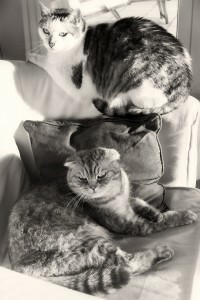 One of the more unique characteristics of the Scottish Fold is the many unusual poses he adopts. 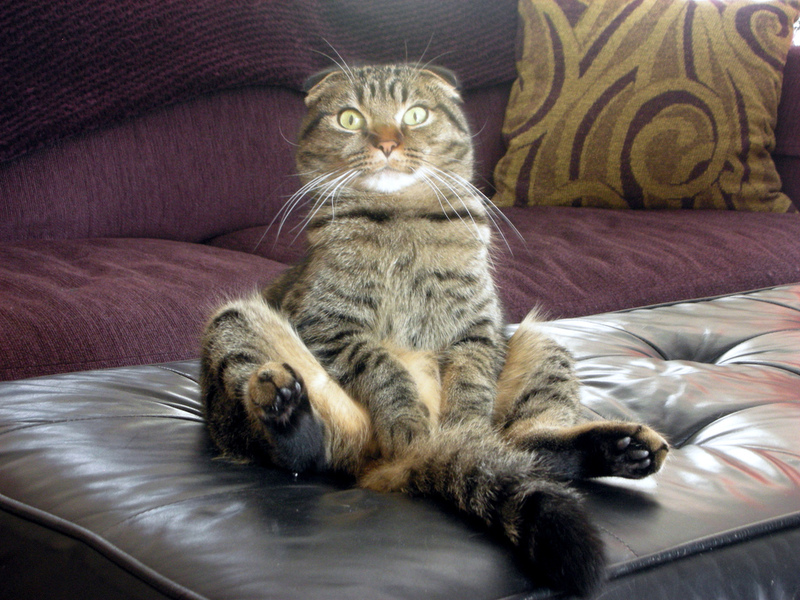 One favorite is to sit on his hind legs with the body upright in a manner similar to that of a prairie dog or meerkat. Lying on his back with feet in the air is a common position to sleep in. They will also lie flat out on the ground in a frog like fashion. They tend to do well at homes with children and other pets. They are naturally amiable and go with the flow. They travel well and are not usually shy making them an excellent choice for cat shows. They can get a little lonely if they are left on their own routinely for extended periods of time though. As a result, if everyone works or attends school during the day it may be best to get a companion for your Scottish Fold. Since they get along well with most cats and cat friendly dogs, another pet is a good choice.